Sofia: I was born in Lima, Peru and arrived to the United States at the age of 10. ​Sofia: I obtained a Bachelor's of Science degree in Accounting from George Mason University. Upon graduating from GMU, I attended The National Conservatory of Dramatic Arts and graduated from the 2 year acting program. Copa: What are your 3 favorite films of all time? Copa: What was the most memorable experience that you have had to date in your acting career? Sofia: An acting experience that was very memorable was when I was part of a stage play at NCDA, where I portray three different characters. One was a very aggressive and controlling character, the other character was a weak and vulnerable older lady and the third character was a curious young boy. It was one of the best experiences of my life!! I was able to successfully portray three completely different character and transform my body and voice within 5 minutes into each character. I enjoyed every second of this experience! Copa: Are there any primary reasons why you wished to become a filmaker? ​Sophia: I love storytelling and after being experienced in the acting industry and connecting with so many people, I knew I could make of my ideas come to life. My main goal was to showcase my writing abilities and with not much support at the beginning, I had to take on a lot of roles in order to make it happen. I had a hard time convincing people to believe in me, due to the lack of experience as a filmmaker, therefore I knew that I would have to produce and direct my own film. Copa: What encouraged you to become interested in the world of acting? Sofia: My passion for acting started as an adult as I was trying to figure out my way into becoming a writer. My love for storytelling and writing began at a very young age and grew stronger during my high school years. After graduating from High School, I attended Virginia Commonwealth University and pursued a major in English. I absolutely loved my first semester at VCU, especially my advanced composition courses, unfortunately when I came back home for winter break I had to make a life changing decision. A family member had 'the talk' with me and insisted that I would starve and be a nobody if I continued to pursue my dream of becoming a writer. I was young and seeing the other side of the coin made me very fearful, hence I decided to come back home and switched my major. I transferred to George Mason University and changed my major to accounting, however I continued to write and knew that I would go back to pursuing it in the near future. Following graduation from GMU, I looked into a program at had at THE NATIONAL CONSERVATORY OF DRAMATIC ARTS in Washington, DC, where as part of their curriculum they offered script analysis courses. As I attended NCDA, I discovered my love for acting and after graduating from their two year program I was cast in numerous local and national commercials as well as TV shows that aired on Investigation Discovery, netflix and PBS Kids. Copa: Who are your most favorite actors of all time? ​Sofia: My favorite actors of all times are Meryl Streep, Denzel Washington, and Jennifer Lawrence. Copa: What was the main reason you decided to write, produce and direct your film? Sofia: I went to an event where the actress Lynda Carter (original wonder woman) gave a very inspirational speech. I was very empowered by it and decided I wanted to make an action film that would empower women. 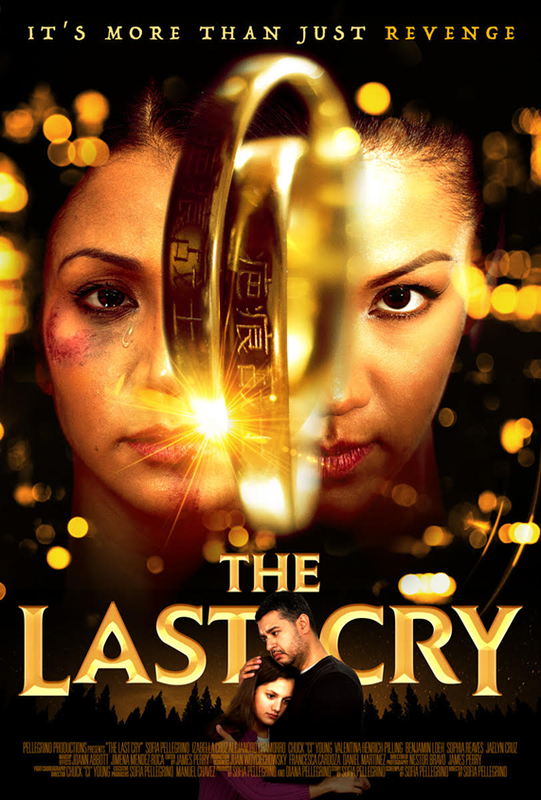 Copa: How long did it take to complete "The Last Cry?" Copa: What does the future hold for Sofia Pellegrino and "The Last Cry?" Sophia: We have another screening of THE LAST CRY in Hollywood on May 4th at Raleigh Studios. We are also launching an indiegogo campaign to get the resources needed for our upcoming series THE LAST CRY- THE QUEST BEGINS. We are looking to start production in December of 2019 and we are aiming to have the series in an online on demand service such as Netflix, Hulu or Amazon Prime.